Hydropower technologies have a long history of use because of their many benefits, including high availability and lack of emissions. Hydropower technologies use flowing water to create energy that can be captured and turned into electricity. Both large and small-scale power producers can use hydropower technologies to produce clean electricity. 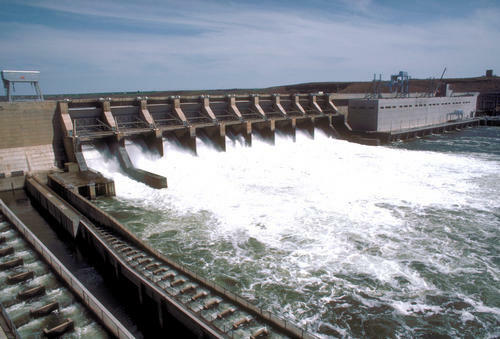 Large-scale hydropower plants are generally developed to produce electricity for government or electric utility projects. These plants are more than 30 MW in size, and there is more than 80,000 MW of installed generation capacity in the United States today. Most large-scale hydropower projects use a dam and a reservoir to retain water from a river. 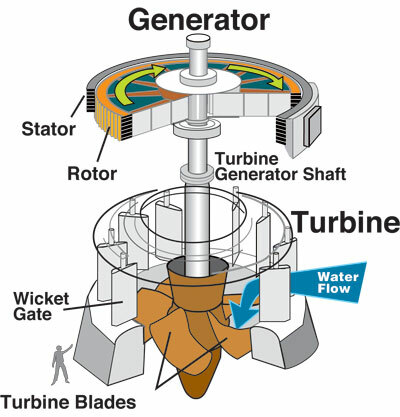 When the stored water is released, it passes through and rotates turbines, which spin generators to produce electricity. Water stored in a reservoir can be accessed quickly for use during times when the demand for electricity is high. Dammed hydropower projects can also be built as power storage facilities. 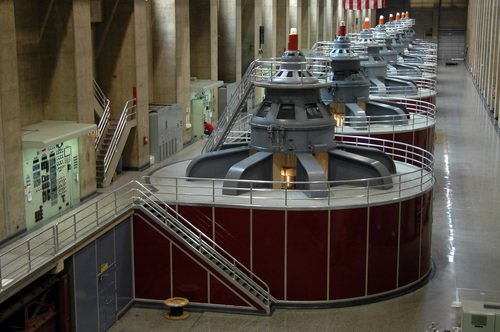 During periods of peak electricity demand, these facilities operate much like a traditional hydropower plant—water released from the upper reservoir passes through turbines, which spins generators to produce electricity. However, during periods of low electricity use, electricity from the grid is used to spin the turbines backward, which causes the turbines to pump water from a river or lower reservoir to an upper reservoir, where the water can be stored until the demand for electricity is high again. A third type of hydropower project, called run of the river, does not require large impoundment dams (although it may require a small, less obtrusive dam). Instead, a portion of a river's water is diverted into a canal or pipe to spin turbines. Many large-scale dam projects have been criticized for altering wildlife habitats, impeding fish migration, and affecting water quality and flow patterns. As a result of increased environmental regulation, the National Hydropower Association forecasts a decline in large-scale hydropower use through 2020. Research and development efforts have succeeded in reducing many of these environmental impacts through the use of fish ladders (to aid fish migration), fish screens, new turbine designs, and reservoir aeration. Microhydropower systems are small hydroelectric power systems of less than 100 kW used to produce mechanical energy or electricity for farms, ranches, homes, and villages. All hydropower systems use the energy of flowing water to produce electricity or mechanical energy. Although there are several ways to harness moving water to produce energy, "run-of-the-river systems," which do not require large storage reservoirs, are most often used for microhydropower systems. For run-of-the-river microhydropower systems, a portion of a river's water is diverted to a water conveyance—a channel, pipeline, or pressurized pipeline (called a penstock)—that delivers it to a turbine or waterwheel. The moving water rotates the wheel or turbine, which spins a shaft. The motion of the shaft can be used for mechanical processes, such as pumping water, or it can be used to power an alternator or generator to generate electricity. •Wiring, which delivers the electricity. Many systems also use an inverter to convert the low-voltage direct current (DC) electricity produced by the system into 120 or 240 V of alternating current (AC) electricity. Commercially available turbines and generators are usually sold as a package. Do-it-yourself systems require careful matching of a generator with the turbine horsepower and speed. Whether a microhydropower system will be grid-connected or stand-alone will determine its final balance of system components. For example, some stand-alone systems use batteries to store the electricity generated by the system. However, because hydropower resources tend to be more seasonal in nature than wind or solar resources, batteries may not always be practical. If batteries are used, they should be located as close to the turbine as possible because it is difficult to transmit low-voltage power over long distances. Dams or diversion structures are rarely used in microhydropower projects. They are an added expense and require professional assistance from a civil engineer. In addition, dams increase the potential for environmental and maintenance problems.